Ignoring requests is the path to simplicity. New offers are usually not good for you. …You will probably want some rules in place for dealing with communication. One simple piece of organizational advice to keep in mind is this: If you are overly busy in general, strive to increase cycle times. Respond to non-urgent conversations more slowly. Cycle times cannot speed up indefinitely, but we sometimes act as if they should. Keep expectations about your response times low; make cycle times longer. In the future, I expect an explosion of information, messages, and communication channels. At the same time, expectations for a quick reply will get higher. Simply ignoring more messages than before is probably the answer in personal settings. But in professional settings, you will continue to be expected to reply faster and faster. I am typically against life prescriptions for other people, but if I have a hope for the society of the future, it would be: Don’t feel guilty about being somewhat slow in your communication. Communication is not a to-do list item. It’s an offer for interaction. Ignoring is the path to simplicity. This is simply where society has to go in the presence of ever-increasing communication technologies. The fact that we sometimes seem to be going in the opposite direction—with more and more communication technologies AND increasing expectations for quick responses—is simply terrifying. Want to read more? 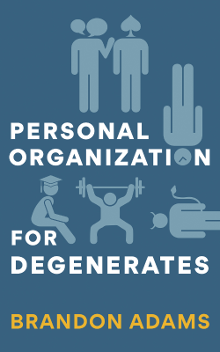 Check out my new book, Personal Organization for Degenerates!